Well, it isn’t exactly my home – I am originally from St. Louis, Missouri. But since my first visit to Mobile 29 years ago the place has kind of grown on me. Monica’s family is from Mobile. Her mom was born here in 1926, but later moved to Cincinnati after marrying Monica’s dad. They returned to Mobile in 1964 to build a house on a plot of family land. Her grandparents divided up their property among the five children, and each of the five children got a plot large enough for a house. So the property has been in the family since 1928, when her grandparents bought it for a mortgage of $200 – how’s that for a big debt? However, considering that her grandfather was a truck farmer and the depression was about to hit, that’s probably a big debt for 75 years ago. Monica’s dad built the house himself in 1964. He was an architect by profession and took several months off from work to build it, along with his brother (who is still alive at age 90 – my father-in-law is now 84 years old). While working on the roof he fell and broke his leg, so his brother had to do a lot of the work himself. 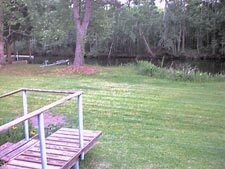 Monica’s grandmother hired someone to dig a canal across the property behind the house, so we are "connected" to a larger canal that leads to the Dog River, which empties into Mobile Bay, which is connected to the Gulf of Mexico. So you can get from our lot into the Gulf of Mexico by water if you are adventuresome. We came here from the UCG conference in Cincinnati. I saw on the Internet that the low in Bonn yesterday was 32 degrees, so the 85 we are having here will do wonders to alleviate the cold I have been dragging around for three weeks. Now if we could only get a decent Internet connection . . .